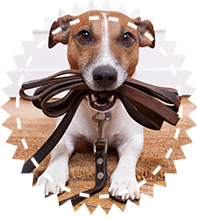 Is your dog misbehaving? Are they not following your rules and you're having trouble communicating with them? Don't worry. Our dog obedience training professionals in Anderson Township, OH are here to help develop some highly effective solutions. We treat each pet individually and always with a positive approach. Find out more about our staff and programs here. Allison has many different techniques and approaches to dog training. She first determines what approach is best for your dog on an individual setting and then tailors all training to your pet. Allison's passion is to educate and empower dog owners using force-free dog training techniques in her puppy and adult dog training classes. For those interested in reaching out and serving their community with their well mannered dog Allison also offers in Animal Assisted Activities/Therapy class several times each year. Allison is a graduate of Animal Behavior College for Canine Obedience and Behavior Modification and has completed an extensive internship with our previous trainer who recently retired to ensure quality advice and continuity. Allison also expertise in animal care and grooming and has done extensive work with troubled pets to help them acquire acceptable manners. She is also certified Canine Good Citizenship and Star Puppy Evaluator. Visit her on Facebook at Pups Unleashed, call her at 513-290-4840 or drop her a note by email at araecamp@hotmail.com. Behavioral training classes begin every week and are integrated with therapeutic touch, marker-based training, and an understanding of canine communication through a positive reward for positive behavior approach. Basic intro to Clicker training, Watch me, Sit, Down, Off, Leave-it, Drop-it and more. Discuss Health needs and Proper Socialization, Nutrition and Behavioral Problems. Expand on all Basic Obedience, learn to work on distance, duration and distraction. Learn Heel and test for Canine Good Citizenship.